With the PassportParking mobile app, you can keep up with the meter while strolling downtown or eating lunch. Just download the app and you can make mobile payments for parking, extend your session remotely and keep track of all parking history. The app is available on the App Store, Google Play and www.ppprk.com. Selecting the proper parking option for your Eureka Springs adventure has never been easier! 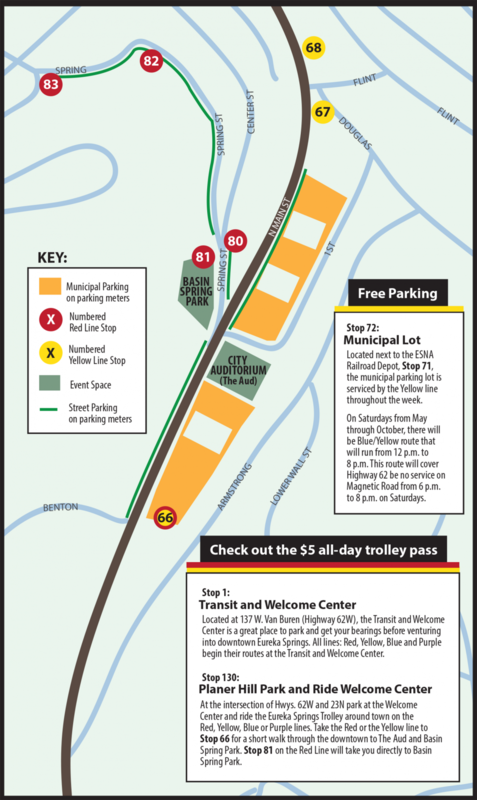 View the downtown Eureka Springs trolley map provided to pick up a a few tips for accessing the downtown. Live Trolley Update: Keep up with the Eureka Springs Trolley lines to gauge your next pickup and drop off.